“That hell,” was a windowless, dark cell in Brooklyn that Anser Mehmood, a Pakistani truck driver, had inhabited alone for four months in 2001. Mehmood was a father to four children, at the time living in the port city of Bayonne, New Jersey on the Atlantic coastline. Guards surveilled him night and day from a computer monitor, watching his morose face harshly animated under the fluorescent lights. The Pakistani immigrant had been caught living illegally in the United States, overstaying a visa like at least 630,000 foreigners in the U.S. last year. However, unlike others, he was caught in the dragnet of post-9/11 surveillance on Muslim-American communities, denied any information on why he was picked up by the authorities. In the years following the September 11 attacks in New York, 1,200-odd Muslim men in the U.S. faced a similar black hole; approximately 500 were expelled. On the surface, the story of detainees like Mehmood seem to paint a narrative of discrimination common to Pakistani and Muslim migrants across the globe. Whether it is rationalized in terms of health checks, visa regulations, or national security concerns, deportation seems to highlight the universally precarious situation of Pakistanis earning their living abroad. Beneath this similarity, however, destinations such as the U.S., Europe, and the GCC (Gulf Cooperation Council) create a diverse set of challenges and deportation outcomes for the Pakistanis who set their sights on opportunities there. Each year, approximately a million Pakistanis go overseas for work. Pakistan is the second-largest exporter of labour in South Asia, and more than 9 million Pakistanis have gone abroad since the 1970s. While the United States and Europe loom large as the preferred destinations, it is the GCC that absorbs the bulk of Pakistan’s workers. 95% of Pakistani migrants end up in the Gulf states, with Saudi Arabia and UAE alone hosting nearly 2 million and 1.2 million Pakistanis, respectively. By comparison, there are only about a million Pakistanis in the U.S. and double that number in the entire European Union. Although the majority of migrant workers remain unskilled, they are united by a desire to help sustain their home country’s economy. In the last year alone, Pakistanis in Saudi Arabia sent home more than $4.5 billion in remittances. In the U.K. and U.S.–where laborers are more likely to be part of the professional or managerial class–$1.8 billion and $2 billion were remitted home, respectively. Although money may be the primary driver of migration, the factors impelling workers to go abroad are varied. “People migrate.. from Pakistan due to poverty, unemployment, political instability, terrorism and war-like conditions in some parts of the country,” lawyer Zia Awan tells DW. The routes and methods Pakistani migrants favor depend on the destination. 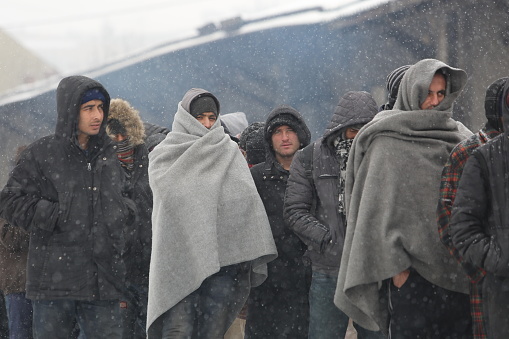 Migrants to Europe undertake circuitous journeys, often traveling by foot to Iran on the way to Italy or Greece. Smuggling networks enable thousands to risk their lives each year to apply for asylum or for the opportunity to earn a better paycheck. For U.S.-bound migrants, family reunification, employment, or education are common visa justifications. 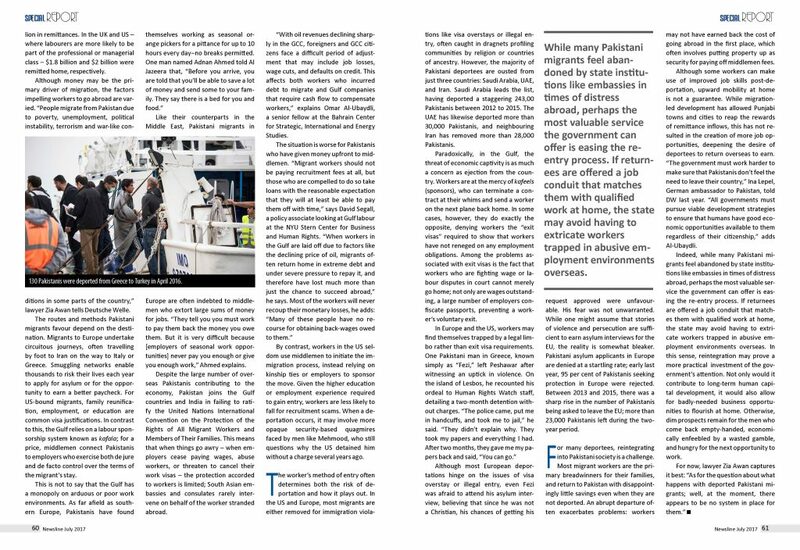 In contrast to this, the Gulf relies on a labor sponsorship system known as kafala; for a price, middlemen connect Pakistanis to employers who exercise both de jure and de facto control over the terms of the migrant’s stay. 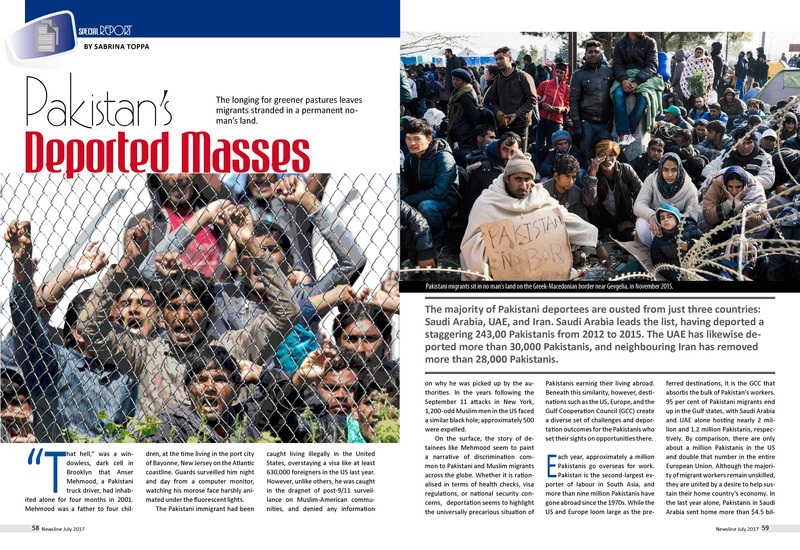 Like their counterparts in the Middle East, Pakistani migrants in Europe are often indebted to middlemen who extort large sums of money for jobs. “They tell you you must work to pay them back the money you owe them. But it is very difficult because [employers of seasonal work opportunities] never pay you enough or give you enough work,” Ahmed explains. Despite the large number of overseas Pakistanis contributing to the economy, Pakistan joins the Gulf countries and India in failing to ratify the United Nations International Convention on the Protection of the Rights of All Migrant Workers and Members of Their Families. This means that when things go awry–when employers cease paying wages, abuse workers, or threaten to cancel their work visas–the protection accorded to workers is limited; South Asian embassies and consulates rarely intervene on behalf of the worker stranded abroad. “With oil revenues declining sharply in the GCC, foreigners and GCC citizens face a difficult period of adjustment that may include job losses, wage cuts, and defaults on credit. This affects both workers who incurred debt to migrate and Gulf companies that require cash flow to compensate workers,” explains Omar Al-Ubaydli, a senior fellow at the Bahrain Center for Strategic, International, and Energy Studies. By contrast, workers in the U.S. seldom use middlemen to initiate the immigration process, instead relying on kinship ties or employers to sponsor the move. Given the higher education or employment experience required to gain entry, workers are less likely to fall for recruitment scams. When a deportation occurs, it may involve more opaque security-based quagmires faced by men like Mehmood, who still questions why the U.S. detained him without a charge several years ago. The worker’s method of entry often determines both the risk of deportation and how it plays out. In the U.S. and Europe, most migrants are either removed for immigration violations like visa overstays or illegal entry, often caught in dragnets profiling communities by religion or countries of ancestry. However, the majority of Pakistani deportees are ousted from just three countries: Saudi Arabia, UAE, and Iran. Saudi Arabia leads the list, having deported a staggering 243,00 Pakistanis from 2012 to 2015. The UAE has likewise deported more than 30,000 Pakistanis, and neighboring Iran has removed more than 28,000 Pakistanis. Paradoxically, in the Gulf, the threat of economic captivity is as much a concern as ejection from the country. Workers are at the mercy of kafeels (sponsors), who can terminate a contract at their whims and send a worker on the next plane back home. In some cases, however, they do exactly the opposite, denying workers the “exit visas” required to show that workers have not reneged on any employment obligations. Among the problems associated with exit visas is the fact that workers who are fighting wage or labor disputes in court cannot merely go home; not only are wages outstanding, a large number of employers confiscate passports, preventing a worker’s voluntary exit. Although most European deportations hinge on the issues of visa overstay or illegal entry, even Fezi was afraid to attend his asylum interview, believing that since he was not a Christian, his chances of getting his request approved were unfavorable. His fear was not unwarranted. While one might assume that stories of violence and persecution are sufficient to earn asylum interviews for the EU, the reality is somewhat bleaker. Pakistani asylum applicants in Europe are denied at a startling rate; early last year, 95% of Pakistanis seeking protection in Europe were rejected. Between 2013 and 2015, there was a sharp rise in the number of Pakistanis being asked to leave the EU; more than 23,000 Pakistanis left during the two-year period. For many deportees, reintegrating into Pakistani society is a challenge. Most migrant workers are the primary breadwinners for their families, and return to Pakistan with disappointingly little savings even when they are not deported. An abrupt departure often exacerbates problems: workers may not have earned back the cost of going abroad in the first place, which often involves putting property up as security for paying off middlemen fees. Although some workers can make use of improved job skills post-deportation, upward mobility at home is not a guarantee. While migration-led development has allowed Punjabi towns and cities to reap the rewards of remittance inflows, this has not resulted in the creation of more job opportunities, deepening the desire of deportees to return overseas to earn. “The government must.. work harder to make sure that Pakistanis don’t feel the need to leave their country,” Ina Lepel, German ambassador to Pakistan, told DW last year. “All governments must pursue viable development strategies to ensure that humans have good economic opportunities available to them regardless of their citizenship,” adds Al-Ubaydli. Indeed, while many Pakistani migrants feel abandoned by state institutions like embassies in times of distress abroad, perhaps the most valuable service the government can offer is easing the re-entry process. If returnees are offered a job conduit that matches them with qualified work at home, the state may avoid having to extricate workers trapped in abusive employment environments overseas. In this sense, reintegration may prove a more practical investment of the government’s attention. Not only would it contribute to long-term human capital development, it would allow for badly-needed business opportunities to flourish at home. Otherwise, dim prospects remain for the men who come back empty-handed, economically enfeebled by a wasted gamble, and hungry for the next opportunity to work. This article originally appeared in Pakistan’s Newsline magazine.